1) Choose Your Style – Brilliance offers many different diamond earring settings in yellow gold, white gold, and platinum to compliment your choice of center diamonds. Our team of diamond and jewelry experts can help you select the setting type that is right for you based upon your budget and choice of diamonds. 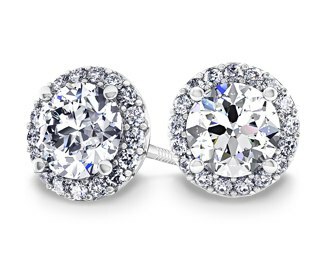 2) Select Your Loose Diamonds – Shopping for diamonds sight unseen can be difficult, especially when selecting a matching pair of loose diamonds for earrings. Our trained experts and gemologists are always available to help you find the best matching diamond pair. Rest assured, should you decide to select two matching certified diamonds on your own we will inspect them and make sure they in fact match and are brilliant. 3) Complete Your Earrings -Once you add the loose diamonds and earrings to cart and complete your order our master jewelers will set the diamonds in the earring settings and they will be delivered enclosed in our signature jewelry box. As with any Brilliance purchase, we offer free FedEx shipping and no sales tax outside of the state of Florida. In addition, All of our products are backed by a 30 day money back guarantee, and our jewelry is covered under our Brilliance Care and Maintenance Policy. Lastly, we invite you to send your earrings back up to twice a year for a complimentary cleaning and prong inspecting.